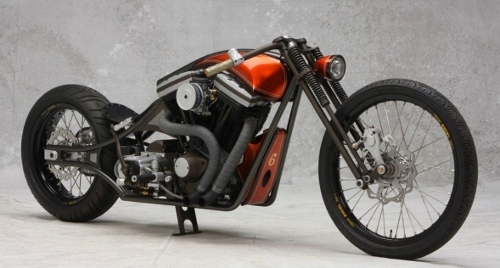 The One Show 2014: "They don't build themselves"
For decades, "custom motorcycle" meant Milwaukee iron chopped and dropped, dipped in chrome and sparkling paint; or British cafe bikes with de rigueur hump tanks, solo seats, and impossibly-mounted rearsets. But the last few years have seen the emergence of a new breed of custom motorcycles, and it's not what you might expect. Fueled by the popularity of motorcycle blogs like BikeEXIF, Return of the Cafe Racers, and Bolts Action, what started as a few isolated builders has grown into clusters of individuals and shops around the world who share the explicit understanding that each motorcycle is an individual, and there's no single right way to make a custom ride. 1970s enduro rigs, pristine sportbikes, BMW airheads, and boxes of Triumph parts are all valid starting points for these builders, and the results are equally diverse. Yes, you'll still see the odd Sportster in the bunch, only now it's a scrambler. Or an urban tracker. Or a fully-faired race bike. Or something thoroughly uncategorizable, except that it's cool. Aided by their online presence, builders all over the world are communicating and collaborating, and the Pacific Northwest is particularly well-represented, with Portland as ground-zero for this new iteration of custom motorcycles. In 2010, Thor Drake borrowed space in an abandoned building in Portland and put together an impromptu show featuring 30 bikes by friends and local builders. Since then the One Show has grown exponentially: in 2013, 100 bikes were on display, and attendees numbered 6,000-8,000 per day. Enthusiasm has been especially visible online, and the show has been lauded across the motorcycle blogosphere. The event has been so successful that Drake took it on the road, to Austin, in 2013, and despite being hampered by difficulties with the venue, again drew dozens of builders and thousands of attendees. Drake has since used Kickstarter to fund and publish two volumes of The One Motorcycle Show Book, which features photography by Chris Hornbecker and Ray Gordon, to showcase the builders and bikes of the One Show. In a parallel development, last year Drake and See See Motor Coffee Co. hosted the 21 Helmets exhibition, which featured custom-painted helmets by some of the scene's best artists. The goal of the 21 Helmets exhibition is much the same: showcase the talents of local artists and encourage riders and builders to bring their personal mark to motorcycling. The 2014 One Show promises to be even more exciting than in years past, with a new venue to accommodate larger crowds, and major sponsorship from BMW Motorrad, Chrome, and Portland's own Icon. Over 100 custom bikes will be on display from prominent custom builders including Biltwell, Classified Moto, Deus, Dime City Cycles, el Solitario, Loaded Gun Customs, Twinline, and Vicious Cycles. The show is free and open to all, riders and non-riders alike ("If you are a human you can come"), and there will be art, films, bands, merchandise, and more. And since it's Portland, there will be food carts, beverages, and coffee aplenty. As the One Show's promoters say, "They don't build themselves," and here's your chance to see a new breed of customs for yourself.